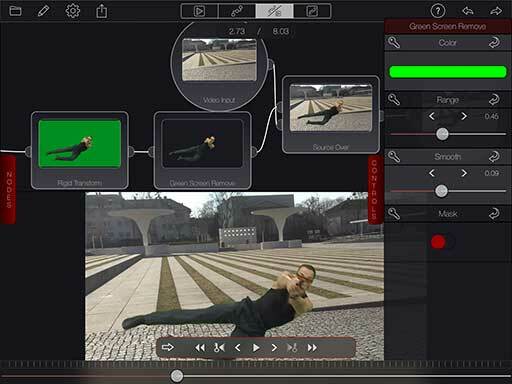 Node-based Compositing comes to the iPhone and iPad. 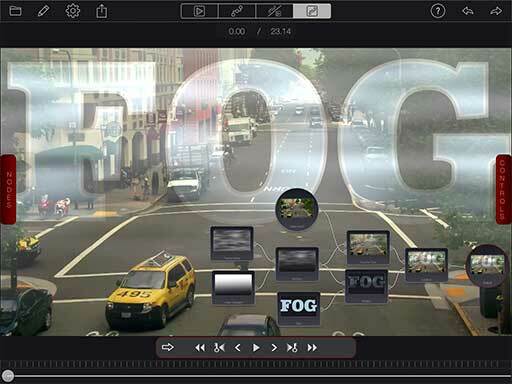 Bricolage is a powerful special-effects toolbox for tricking out your photos and movies like the Hollywood pros do. 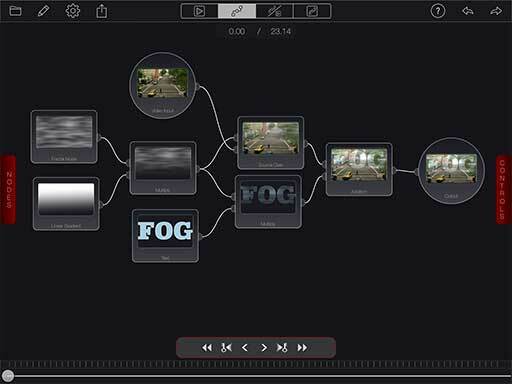 Pipe your video through a chain of basic effects, each processing the picture in a different way. With over 100 to choose from it is easy to create completely unique looks and effects. 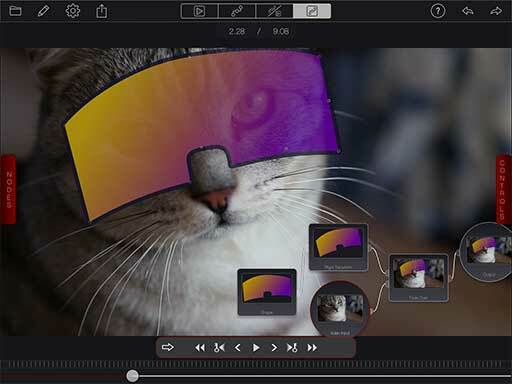 Mix multiple images and animate effects parameters to give your videos the finishing touches they need, from subtle regional color correction or exposure adjustment, to wild cartoon colors or funhouse-mirror distortions. Just bring in a video (or photo!) and drop effects between the input and the output. 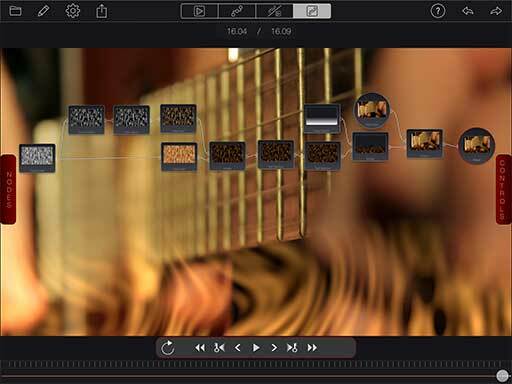 Bricolage takes advantage of the powerful graphics hardware in your iPad or iPhone to deliver smooth playback and responsive controls. You can even zoom into your video while it is playing. Bricolage uses the industry-standard technique known as node-based compositing to build complex effects from a chain of simple building blocks. You combine different layers using photoshop-style blending modes or black & white masks. Make different versions of an image and combine them back together to blur or darken the edges of an image, or selectively recolor the sky or ground. Use animated transitions to switch video streams or overlay text and graphics. Apply image distortions and move them around the video, or use Apple's Face Recognition technology to mark or cover faces detected in your video. 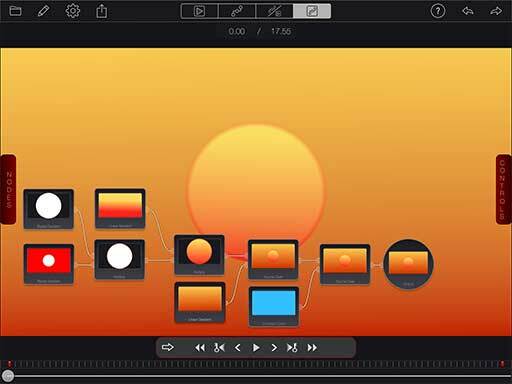 Place, scale and animate video overlays or shapes and gradients. Process your shots to look like a desert, or add film grain and a vintage photo process. You can even add titles or overlay time code on your movies. And when you've built a great effect, just save it to a 'flow' to reuse and combine with other projects. Despite its great power, Bricolage is quite simple to use. 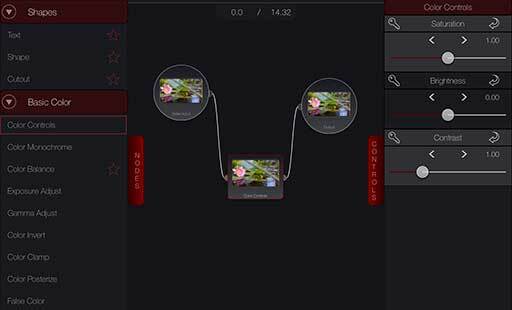 Just build a chain of effects for your images to flow through from the inputs to the output. Drag effect nodes to 'kiss' the output of one to the input of another to form a connection. Or press and hold a link to insert a new node in the middle. With a zooming, scrolling canvas, you can organize your flows the way you like. Immediate feedback in the nodes makes it easy to experiment..
Or even create beautiful compositions with no live footage at all, using only gradients and shapes within Bricolage.